Level up your skills with this machine. The Long Arm Design and massive table provide you with 25” of sewing space. Elevate your quilting projects with this advanced quilting machine. It's Long Arm Design plus an Extra-Large Extension Table provide you with 25-inch of sewing space so you can manage quilts and large projects with ease. When you use the Drop Feed feature to thread paint, you can see your creations clearly with 6 StayBright LED lights. The included Knee Lifter is a must-have for hands-free pivoting and fabric release. Embellish your projects with precise circles 10-inch to 15-inch in diameter with the Extra-Large Circular Stitch Capability. Use one of the 215 Built-In Stitches to appliqué circles or create your own fabric patterns with partial circles. OneTouch™ Stitch Selection (5)Stitches are displayed on the machine's front panel. 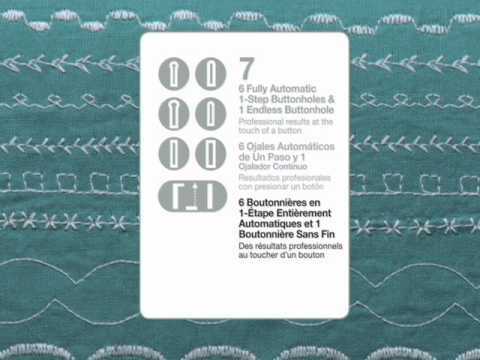 Simply touch of the button for the stitch you want and start sewing.